Gloria has been designing and creating quilts for more than 30 years. Her designs grace family and friends bedrooms as well as clients homes. Her largest quilt to date is included in the pictures and is a 'California King Latte Quilt". 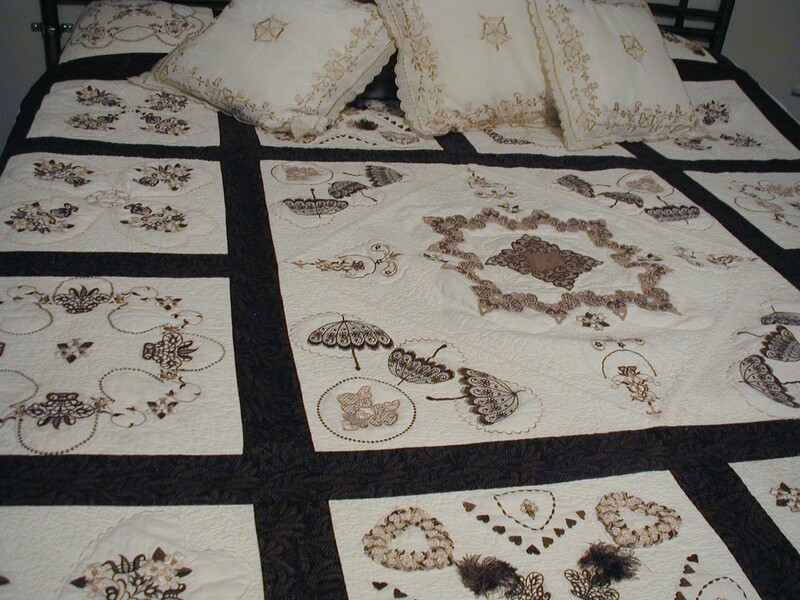 The quilt is a combination of high end commercial machine embroidery with intricate lace embroidery and traditional quilt blocks. This particular quilt has been displayed at professional quilt shows and has more than $600 in thread alone in it. The quilt is valued at over $10,000.00 and took more than 2,000 hours spread over 5 years to complete. Gloria will help you design and create your own quilt for you or your family. She can create the quilt for you, or help you as you create your own family treasure to passed down for generations. She offers classes at her studio or she can come to your home to help you as you work on your own. Included in the pictures are some of the latest quilts created for her many grandchildren. Come back often as she will continue to display the numerous quilts she continues to work on as they are completed.